The town of Bundi, has a rustic appeal that manages to captivate and enthral its visitors. Surrounded by Chittagong in the south west, Tonk in the north and Bhilwara in the west, the city is located 35 km from Kota and 210 kms from Jaipur city. Dotted with scenic landscapes, crystal lakes and colourful monuments, Bundi has something to offer its every visitor. Not only is the place apt for sightseeing it is also a great place to hunt for some of the finest ornaments and artefacts. To experience the glory of the Rajputana era, the Bundi Palace is a must visit. Decorated with ornate paintings, intricate murals and majestic interiors, the Bundi Palace true represents the opulence of the erstwhile Rajputana era. As much as it is beautifully breath taking at day, the palace looks even more gorgeous at night. With the special lighting arrangements, the Bundi Palace literally comes to life at night. Constructed during the reign of Umaid Singh, the Sukh Mahal is one of the most beautiful palaces in the area. 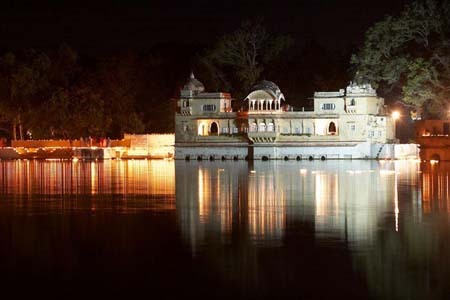 With the Lake Jait Sagar at the periphery, the palace is surrounded by breathe taking landscapes and lush greenery. Standing majestically with an ornate chhatri that welcomes its visitors, the Sukh Mahal is a must visit in Bundi. Much of the Taragarh fort today is left in ruins, but nevertheless, the monument still has glimpses of the glory it once possessed. Constructed in 1354, the Taragarh Fort is known as the ‘star fort’ as it has some interesting features that add to its star quality. The fort is known to house three huge reservoirs of water, which are believed to have never gone dry. These are inaccessible today, because of lack of any maps. The fort houses the giant Bhim Bhuj that once housed the Garbh Gunjam, a particularly large canon. The fort also offers tourist a panoramic view of the city of Bundi. Built by Rao Anirudh Singh, the Chaurasi Khambon ki Chhatri or the 84 Pillared Cenotaph, is a two storied structure, that has carvings depicting animals. The monument is believed to have been constructed in honour of the king’s nurse, Deva. The monument is so named because it rests on 84 pillars. This huge step well resides outside the city walls of Bundi. With ornate carvings and painting depicting Vishnu’s Dashavatar, the Bauri is one of the finest examples of the skill possessed by the artists and craftsmen during that era. Carved on the walls of the bauri one can see the Matsya, Kurma, Vaman, Narsingh, Parshuram, Rama, Krishna, Budhha and Kalki, the various avatars of Vishnu.